Every rebound from oversold levels carries a lot of investor hope and can result in frustration. Investors always want to see a monster V bottom where the market rallies vertically back to prior highs. Unfortunately, that rarely happens. V bottoms do occur but normally from smaller declines. The most prevalent type of rebound is the W bottom where the initial recovery fails and the prior lows are retested. They are not always retested exactly to that prior low and can rebound again from a slightly higher low. Then again, sometimes a new low is made that negates the prior low and the scenario is doomed to repeat. In the current market I doubt the prior lows will be retested. The factors producing that low are now behind us and 2019 is a new year with new hopes for a retest of the highs. The decline into last Monday's lows was dramatic with the S&P falling 16% in only 14 trading days. Dramatic moves of that intensity tend to be followed by equally dramatic moves in the opposite direction. The Dow's record gain of 1,086 points on Wednesday is a prime example. Conditions were so oversold that the slightest uptick in buying volume caused a monster short squeeze. Now those oversold conditions have been relieved to some extent and the market will rise and fall on fundamentals and new headlines. With earnings expected to be in the 22% range and the economy at a 3.0% GDP rate and the Fed on hold temporarily, the calendar will be the governing factor. The new tax year begins on January 2nd for portfolio managers and they have a lot of cash to invest. Not only do they have the cash from all the selling, but they have all the fund flows from year end retirement contributions. In theory we could have a strong January. The could be another hiccup in early January on portfolio restructuring and lingering tax loss sales but that dip should be bought. Despite the record Dow gain on Wednesday, pessimism was over 50% for the first time since 2013 while neutral sentiment was at an 8-year low. 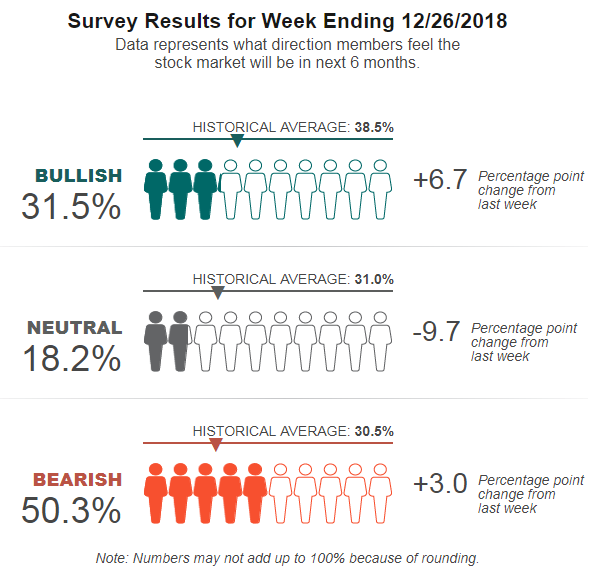 This survey ends on Wednesday, so the big market rebound is included. 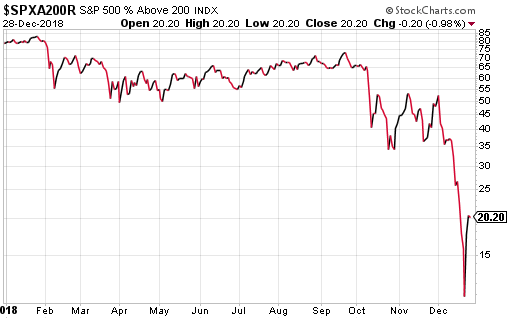 As expected the A/D line on the S&P showed a major bounce. 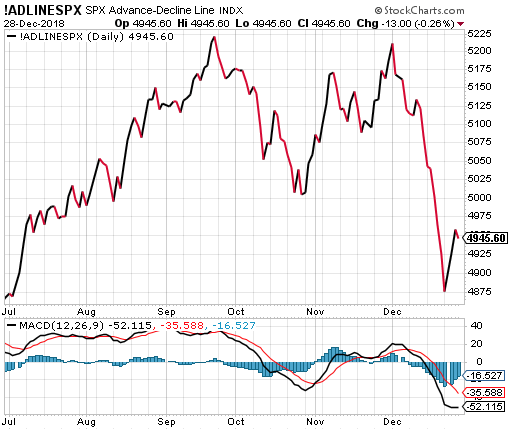 The A/D line on all the indexes showed a similar recovery. 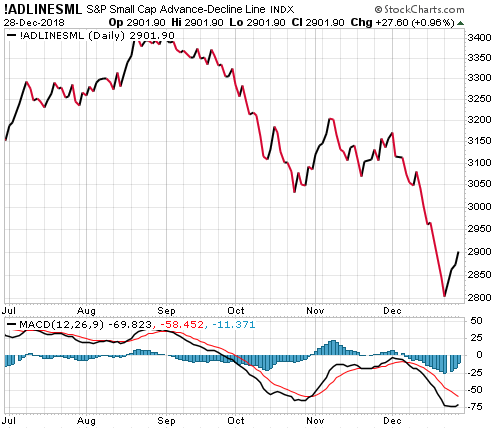 However, the small caps posted only a minor rebound indicating there is still a lot of concern over their performance in a rising rate environment. 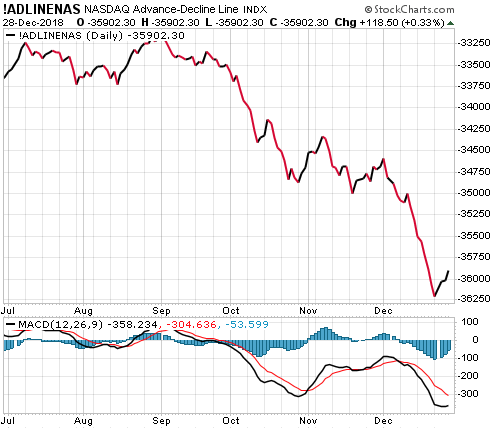 The A/D line on the Nasdaq also was lackluster suggesting the broader tech market was not as positive as the big caps. 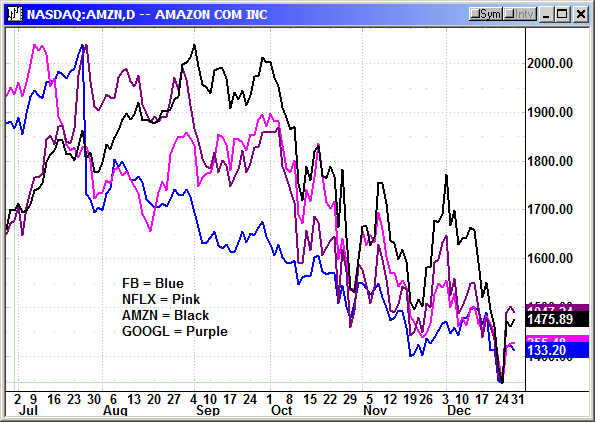 The FANG stocks rebounded as a group with each finding their own level of resistance. Facebook is likely to roll over the hardest after a NYT story on their inside reaction to negative publicity and Zuckerberg's comment that their problems could take years to fix. 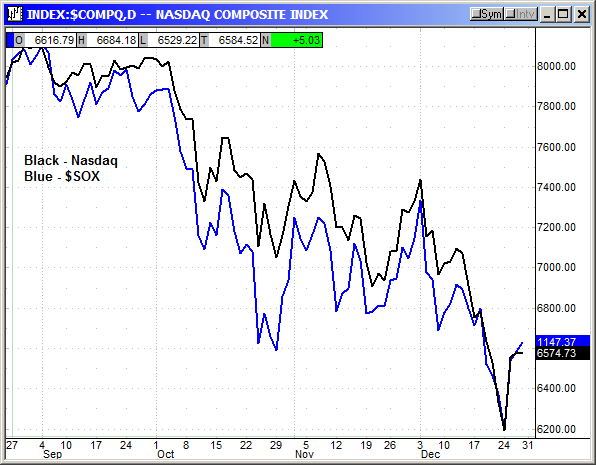 The chip sector rebounded with the Nasdaq and led the index slightly. With chips so badly beaten over the last several months we could see them become a leadership group, but Apple's earnings and commentary will still be the governing factor. 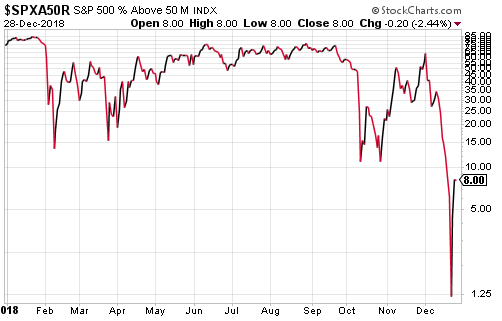 A shocking statistic on the S&P was that the percentage of stocks over their 50-day average fell to only 1.2% last Monday. That has risen to 8% but that is still extremely anemic. The percentage over their 200-day fell to 10.8% on Monday and rebounded to 20.2% on Friday. These are extreme examples of the severely oversold conditions. 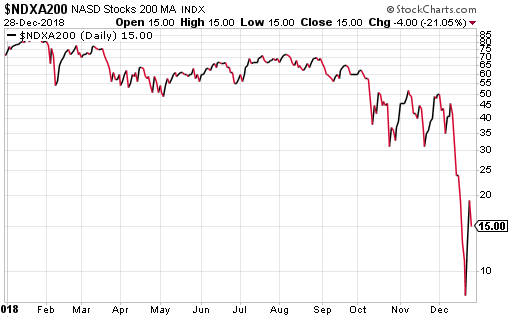 The same chart for the Nasdaq saw only 10.8% of stocks over their 200-day on Monday. Only 3% were above their 50-day average. 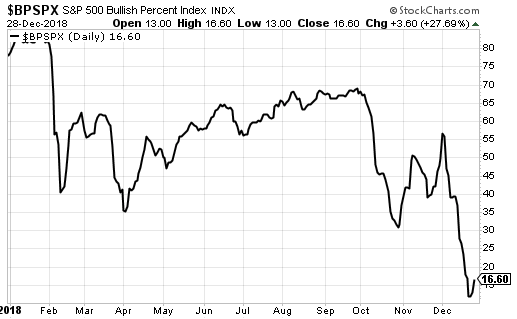 The Bullish Percent Index fell to only 11.8% of stocks with a buy signal on a point and figure chart. This is the lowest level since 2009. 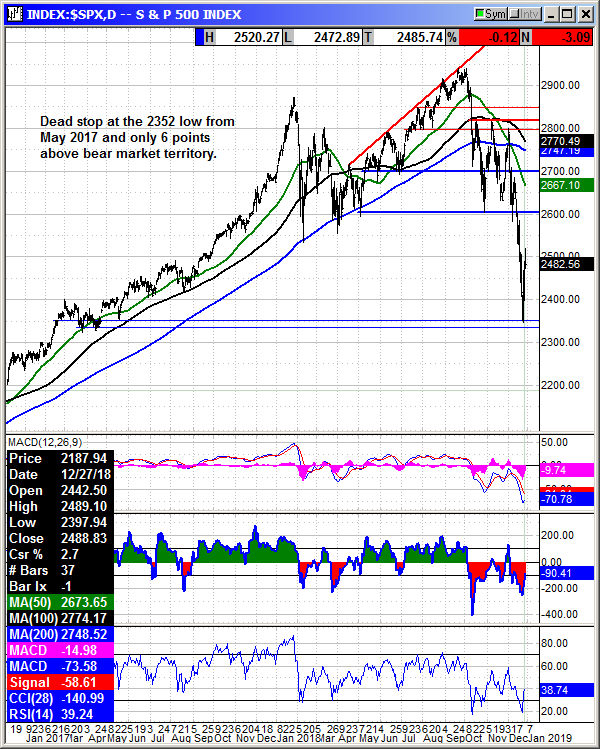 The S&P came to a dead stop at the 2,352 low from May 2017. This was the beginning of about a 20 point range from the April-May lows and a perfect place for a rebound. Without trying to put too fine a point on the analysis for this week, we have reached a point of maximum pessimism and I would be VERY surprised if we did not move higher from here. Stocks are cheap, the economy is strong, the Fed is being forced back into a holding pattern, inflation is low, unemployment is at multi-decade lows, earnings are strong and there is no recession in sight. We do not get very many buying opportunities like this. If you had looked at the S&P chart above in September and somebody told you there would be a buying opportunity in December at 2,350, you would have probably mortgaged the house and kids and been waiting breathlessly for the drop. This is that drop. There may be more volatility ahead, but this is a buying opportunity.